Two-person team Contingent99 has been hard at work on their procedural roguelike RPG Wizard of Legend since well before their successful Kickstarter campaign finished funding in July 2016. Now released as a digital game across multiple platforms, was this hack-n-slash action RPG with a focus on collecting cards and relics worth the wait? Time to find out in our Wizard of Legend review. There’s not a whole lot going on in the story of Wizard of Legend. The player assumes the role of an up-and-coming wizard, who attempts to defeat three master wizards in a contest known as the Chaos Trials. Though there are only nine levels to pass, including three bosses, they are filled to the brim with tough enemies requiring precise timing in order to come out victorious. roguelikes are all about the challenge of relying upon an improving skillset to win, and Wizard of Legend does this by providing a multitude of enemies to defeat, and high damage against the player should they get hit. 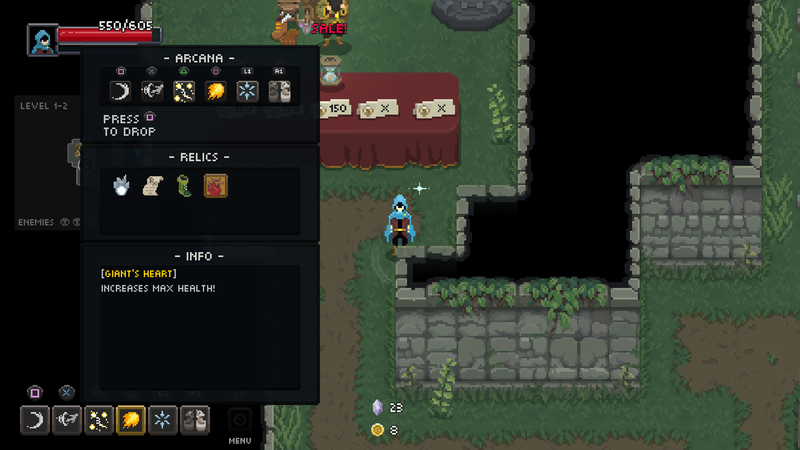 Wizard of Legend presents itself as a game ripped straight out of the early ‘90s. Its pixel art and synthesized audio work is wonderfully nostalgia-inducing. There are three different themed areas generated for the dungeons, including a forest area, fire area, and ice area. Each area consists of two procedurally-generated levels, followed by a tough boss fight with those same elements as the basis for their attacks. It is not known ahead of time what the order of areas will be ahead of time, so a good player comes equipped with abilities that can suit any environment, which is easier said than done. Many roguelikes include some sort of character progression in the hopes that the player can last longer and longer between deaths. Wizard of Legend doesn’t really include traditional character progression, as there are no levels to earn either on the player or equipment. Instead, Wizard of Legend relies on experimentation and skill honing if the player expects to make progress. Each time the player dies, any gold collected is reset to zero. However, magic gems, which are harder to come by, are banked. These gems can be used to unlock new arcana, relics, and outfits, as well as to purchase temporary buffs for the next playthrough. Arcana are special cards that allow the player to perform certain moves. The player goes into each playthrough with a standard hand of four cards, each mapped to a face button or L1/R1 as desired. Since the randomly-generated dungeons will have pits that must be traversed over, one card that is required to always have on-hand is an arcana that quickly transports the player over a gap, with some card leaving behind decoys or other special effects. Two additional cards can be picked up over the course of a run through the campaign, usually featuring special abilities both offensive and defensive. Any arcana picked up during the campaign are lost when the player is defeated, however, and so it really serves as a way to try an arcana before they are added permanently from a merchant prior to battle. Does this system of arcana and relics work? It’s fair to say that it isn’t for everyone. Finding the right combination of arcana and relics takes a lot of dying and experimentation, and even sheer luck. What a particular arcana or relic does is not explained until it has been picked up, which usually means spending precious magic gems outside the dungeon as well as gold inside. Enemies do occasionally drop arcana, but this is a very rare occurrence. Some players may hate the idea of buying an arcana with an epic-sounding name, only to be let down in that arcana’s abilities. But most people will likely look forward to their next unlock, and will attempt to integrate it into their play style. There are even special cursed relics freely given by a nefarious-looking hooded merchant within the dungeon. These usually grant a powerful buff, such as increased damage and stun rate, but they have a great cost attached, such as cutting the player’s maximum health in half, which means every hit counts. Part of the fun is learning what to pick up, and what to avoid. Co-op is rarely a word used in association with roguelikes, and yet Wizard of Legend has such a feature. Couch co-op will increase the odds that the game will be seen through to completion, if teamwork is achieved, that is. The feeling of achievement that comes across when successfully working together and defeating Wizard of Legend’s imposing bosses is reminiscent of Towerfall: Ascension, and that is a great thing. Wizard of Legend has a certain charm that many roguelike fans will fall for. With 144 relics to find, and almost as many arcana, the staggering number of potential combat combinations is impressive. The procedurally-generated levels mean no two playthroughs are the same, however, options for replaying a particularly cool layout are slim. Some people may not like the difficulty level, but then again roguelikes are often tough for a reason, to keep players coming back to prove themselves. It may be a bit repetitive in spots, but for those looking to challenge themselves, Wizard of Legend is the latest roguelike to pick up, and for only $15.99 to boot ($14.39 for PS Plus members). Wizard of Legend review code provided by publisher. Version 1.01 reviewed on a PS4 Pro. For more information on scoring please see our Review Policy here.